When you’re craving a rich, creamy pasta bake, look no further than this chicken mushroom cannelloni recipe. 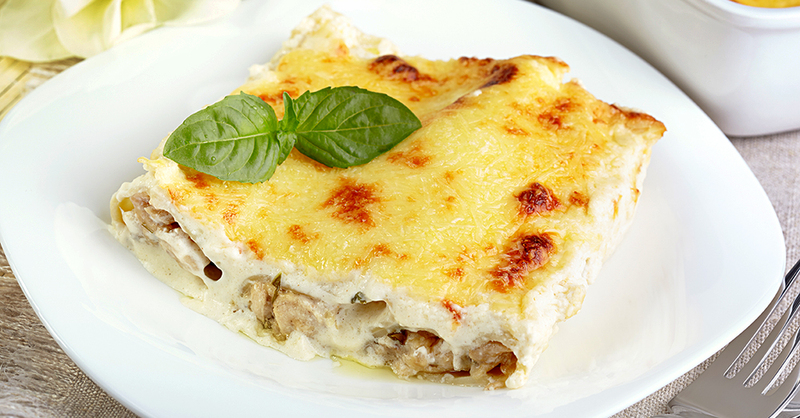 Unlike traditional beef cannelloni with red sauce, this recipe features chicken and mushrooms smothered in silky béchamel sauce. It comes together in a little over an hour, and you can make it ahead of time as a quick mid-week meal. This stick-to-your-ribs casserole is also a delicious meal for company and pot-luck dinners. Make it once, and don’t be surprised when it becomes a favorite that your family asks for by name. Melt butter in a small saucepan over low heat, then stir in flour and cook for 2-3 minutes, stirring continuously. Gradually pour milk into saucepan, stirring to incorporate, then add in mustard, salt and pepper. In a separate pan over low heat, sauté onions until softened and translucent, 6-8 minutes. Add mushrooms and cook until softened. Move onions to the side of pan and add chicken. Cook for about 8 minutes, or until chicken is cooked through. Cool the chicken mixture for 10 minutes. Spread 1/3 cup béchamel sauce on the bottom of a 9x13-inch baking dish. Fill cannelloni tubes with chicken, mushroom and onion mixture, then lay them flat in baking dish. Pour remaining sauce over stuffed cannelloni, then sprinkle with parmesan cheese. Cover baking dish with aluminum foil and place in oven. Bake for 30 minutes, then uncover and bake for another 10, or until cheese is golden brown.